This tutorial shows you how to access directly to pixels. See reference on direct pixel access. This procedure creates a bitmap of the same size as the available client space. Then the loops access directly to pixel data to render a bidimensional gradient. Finally the image is drawn and freed. 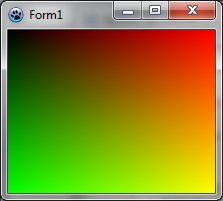 Defines a red component varying from 0 to 255 from left to right. The maximum value image.Width is never reached by x, so the red component never reach 256. You should see a form with a gradient where corners are black, red, yellow and green. When you resize the form, the gradient is resized accordingly. You can use hue, saturation, and lightness. To do this, declare a THSLAPixel. It's values range from 0 to 65535. 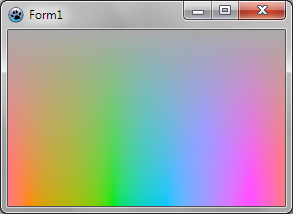 To convert it to standard RGB pixel, use HSLAToBGRA. Notice that the range of oranges is wider. Finally, in the HSLA model, the lightness L does not correspond to the perceived lightness. 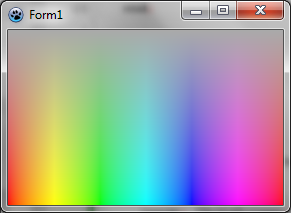 Instead of only correcting the hue, you can use GSBAToBGRA and BGRAToGSBA instead of HLSAToBGRA and BGRAToHSLA. The G here means that the hue is automatically corrected and the B means it's the perceived lightness (sometimes called Brightness) which is taken into account. So you don't need to call GtoH and HtoG explicitely. Note that the THSLAPixel type is used, whatever the correction of the color model. With full color correction, the gradient is more progressive, and looks like what you would obtain with the Lab color model. This page was last modified on 4 May 2015, at 12:54.